spacebones (6 months ago) Inappropriate? What a lovely, lovely model ! Plus, its 'Look and Feel' is so 'right' ! Have fun with your new comp! My second time downloading this one, but for my new computer. 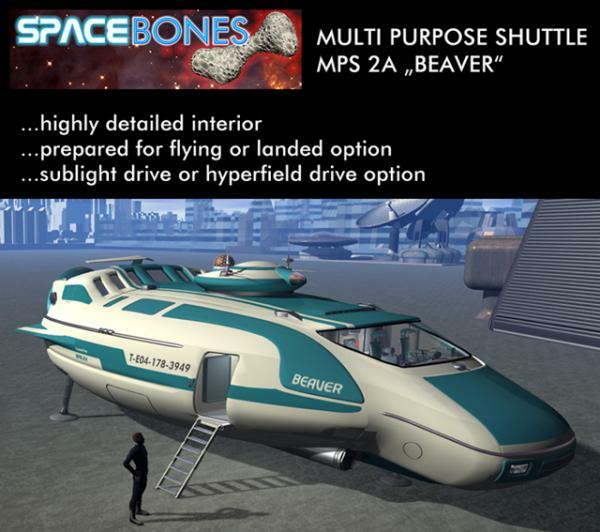 The Beaver is a top quality ship model, in my opinion. Thanks SpaceBones! You are the man! My second time downloading this one, but for my new computer. The Beagle is a top quality ship model, in my opinion. Thanks SpaceBones! You are the man! Thanks for the generosity! Can I use it in my comic story as part of the background? daunty (2 years ago) Inappropriate? This is one nice ship, love it. If you set scale to 750 it will be at Mattymanx chosen scale of 1 unit = 1 Meter for the purpose of rendering with Trek Meshes. welcome, rev! Perhaps you might want to use the Carrara Version of this model directly? revenger681 (6 years ago) Inappropriate? Cool model! I think I'll open it up in Carrara and change around some of the texture zones, perhaps make some minor changes and create bones for other things (Like a turret, I'm thinking a double cannon). howy2012 (6 years ago) Inappropriate? Sorry to anybody who encountered inconveniences by that! hogopogo (6 years ago) Inappropriate? Very nice freebie. Thanks for your hard work! That is awesome like a motor home for space! Pretty, pretty awesome work!!! Thanks so much for sharing. Joy!